The reactions we received upon posting an image of a Hainanese chicken rice cocktail on Instagram Stories were that of incredulity. “OMG”, “Why?”, “No” and so forth flooded our Direct inbox, and while these reactions were less than favourable, they were very much expected. Singaporeans are conditioned to be wary when it comes to bastardisations of the food and drinks we love. While a predominant part of society thrives on novelty and gimmick, a larger section of the population leans towards the defensive when the thing that ain’t broke gets fixed. Hey, we’re protective over our chicken rice. It’s a national sentiment that can’t be changed. Yet, the boozy chicken rice we sampled was anything but a gimmick. It was the brainchild of Edwin Poh, one of the bartenders at newly-opened Amrith. Formerly of Ah Sam’s Cold Drink Stall, Poh’s fondness for Asian flavours has long been a signature style, and this approach is taken to the next level at his new station. His poultry-inspired cocktail melds a spicy, sesame-washed rye, cucumber extract, homemade soy syrup, chilli, calamansi and ginger liqueur to create a layered composition rife with the flavours you’d find in a bowl of chicken rice. 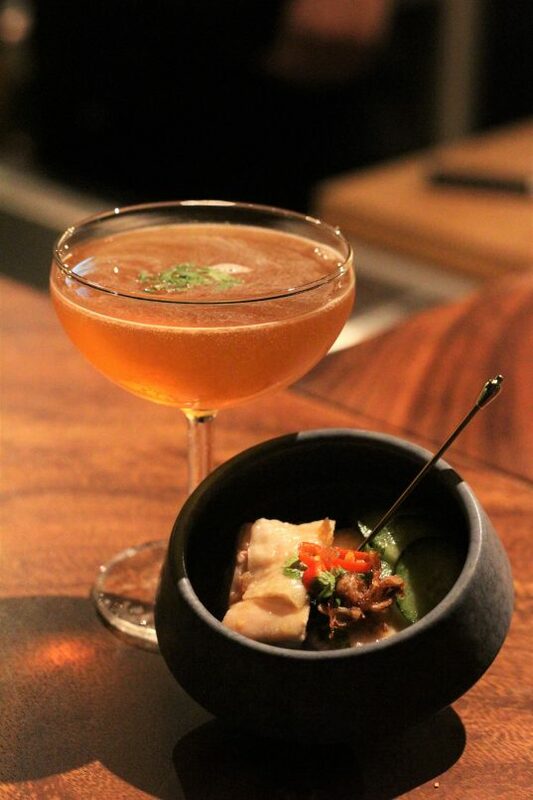 The piquant drink is sprayed with a sesame and shallot sauce to enhance the aroma, and served alongside bites of kou shui ji (Hainanese-style chicken in chilli oil) — take a sip, then a bite, and it tastes as if you’re enjoying a fragrant plate from a hawker stall, without any loss of its integrity as a cocktail. Chicken rice is just one of the local foods adapted in the Singapore section of Amrith’s menu. The venue boasts other favourites like Katong laksa, ice kachang and more, and this forms but one fraction of the innovative and universal menu, designed for cocktail lovers of every persuasion. 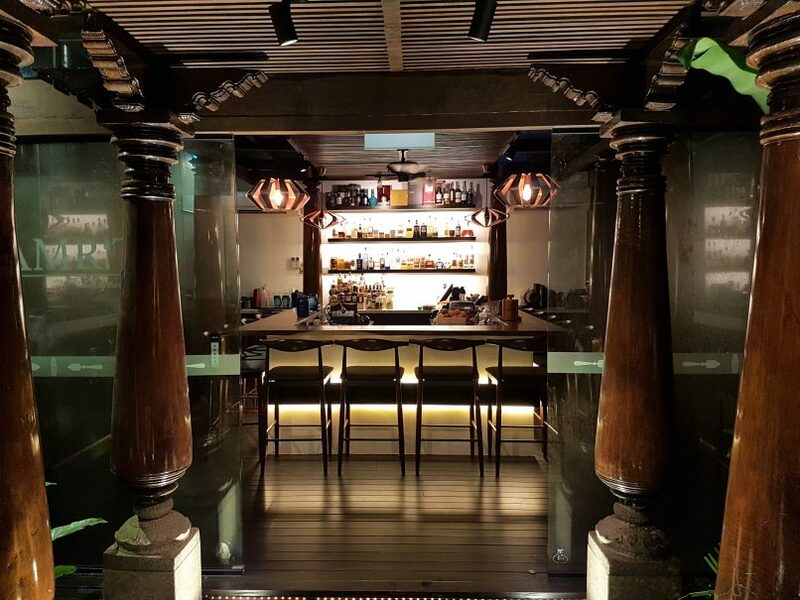 Amrith is established by Song of India, the Michelin-starred restaurant, in conjunction with the BarSmiths Hospitality group, helmed by Mark Tay, a veteran of Singapore’s cocktail scene. You might also know Tay as the face behind Nektar, one of Singapore’s earliest bespoke cocktail bars. Amrith, which is Sanskrit for “nectar of immortality”, stands as a reworked tribute. Here is why you should pay it a visit. The compact establishment is a glass-walled pavilion located next to its neighbouring restaurant. A U-shaped bar forms the centrepiece, seating 15 on tall bar stools. There is an al fresco area too. Expect warm, burnished mahogany furniture, copper fixtures, dim lights and smooth jazz — all of which creates an inviting mood, ensuring you stay past one drink, and you ought to. The hand-bound menu is divided into various sections, kicking off with travel. This portion of the menu will change, but Singapore and Spain currently hold a spot. Aside from chicken rice, we also sampled Poh’s reinvention of the Singapore Sling called The Lion City. He takes the typically sickly sweet novelty and swaps out most of its components for homemade interpretations. 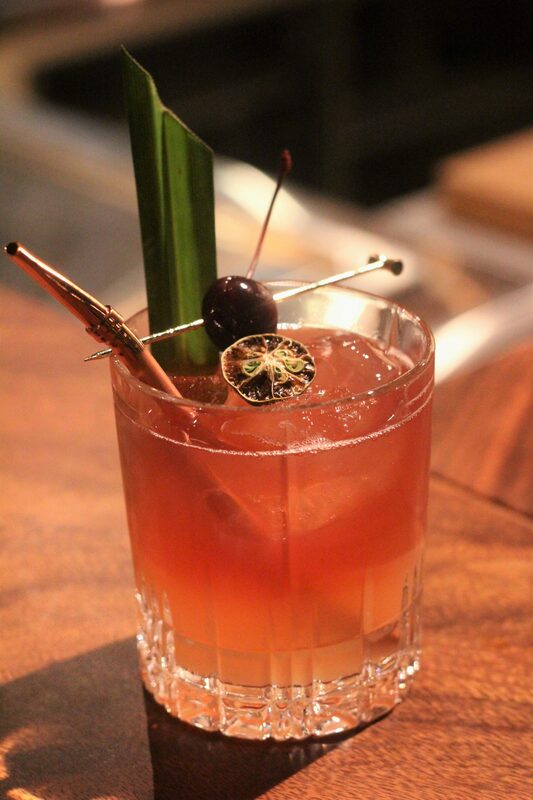 London Dry gin is shaken with soda made from Bordeaux cherries steeped in Kirsch, ginger liqueur, calamansi juice, pandan syrup and a pineapple drinking vinegar. When compared to its original, The Lion City is a zesty starter with fresh ginger and red fruit notes that come through. We took a quick jaunt to Spain with the Iberian G&T — a barrel-aged union between a gin and tonic, and a white sangria. Designed by Tay, this fizzy mix is a treat for those who enjoy slightly green, oaked Chardonnays. The drink aerates in small Limousin oak barrels for a week, endowing it with a strong, woody character. The final product is finished with grapefruit tonic for a citrusy kiss. The final drink, called Clear Skies After Eight, is a vodka martini based on an After Eight mint. You’d expect it to be the colour of a Grasshopper, but the beverage is completely transparent and has the viscosity of water. Tay proudly calls this his baby, and for good reason. A chocolate mint martini goes through rotovap evaporation, then cryofiltration, before being put through the rotovap again. It sounds like a lot of scientific jargon, so we’ll distill it for you: Despite its clarity, the drink is a creamy, rich cocktail that goes down like a square of peppermint chocolate. Exquisite. Other sections of the menu are dedicated to fruity and refreshing tipples (a homage to all of you who request this from a bartender), and spirit-forward libations. Amrith also has a series of bespoke flights on the menu that gives patrons the chance to sample bottlings they might not be able to find elsewhere. Each flight comes with three spirits, and the customer has full liberty to decide exactly what they want to try. Simply pitch your fancies to Poh or Tay, and they’ll recommend accordingly. Those coming in a big group can order one of the five punch bowls on the menu. Amrith currently does not have food on the menu, but there are plans to roll out an Asian tapas menu soon. It serves a complimentary bar snack of tapioca chips, which are tossed with paprika and white truffle oil, and are extremely moreish. Poh and Tay have a flair for the spectrum of consumer tastes, and an awe-inspiring grasp on both the art and science behind mixing drinks to the table. 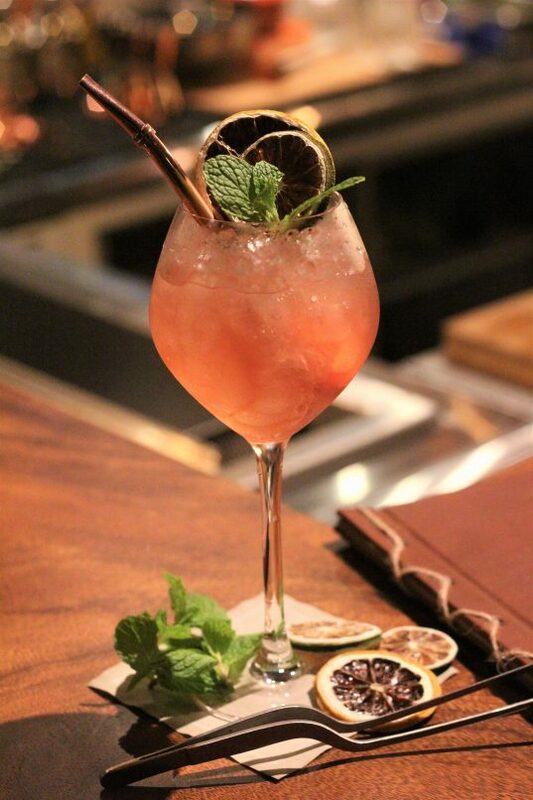 Every glass at Amrith is an intricate surprise, reminding us exactly why a well-made cocktail pleases so. Recommended Drinks: The Lion City, Hainanese Chicken Rice, Clear Skies After Eight. Price: An average of S$25 per cocktail. Noise Levels: The crowd is typically pre- and post-dinner, so to avoid a swarm, come during meal times. 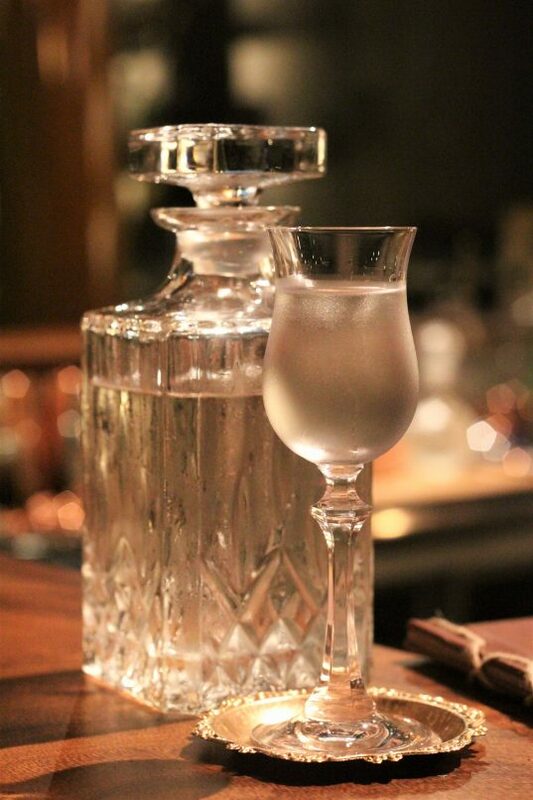 Service: Impeccable and attentive, with the bartenders willing to explain orders and attend to requests.